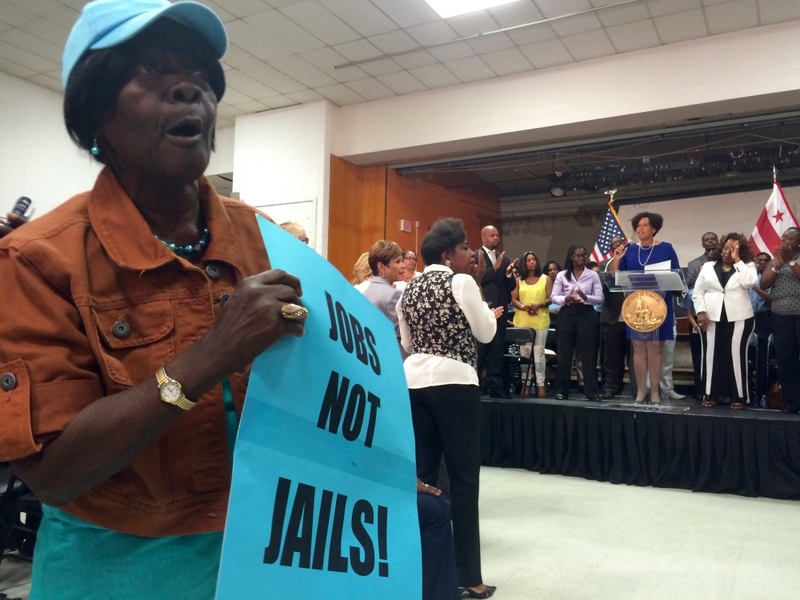 A woman protests during Mayor Muriel Bowser's address (Cuneyt Dil/The Eagle). Mayor Muriel Bowser first bellowed over the protesters, and her allies leapt to their feet to her defense, attempting to drown out the Black Lives Matter activists yelling and heckling the mayor’s proposed plan to curb killings in the District. “Who’s with me?” the mayor smiled and asked repeatedly, as officials and fans of her 5-part “Safer, Stronger DC” proposal cheered at a packed address outlining the plan Thursday. But then the activists drowned out the mayor: “That’s not the answer,” some cried out after Bowser, a Democrat, announced she will put hundreds of more cops on the streets in response to a homicide surge. “Ward 8 matters,” they chanted, referring to the location of the speech, held in the Congress Heights neighborhood of Southeast, inside a packed and hot school auditorium. “Jobs, not jails,” they erupted when the mayor called for stricter penalties on repeat offenders. For close to half an hour, amid chants and boos, Bowser struggled but plowed through a speech dense in policy proposals to stem a recent rise in violent crime and a 43 percent spike in murders. The mayor’s policy package would beef up police presence and bring reforms intended to improve police-community relations. It would also raise penalties on individuals under parole or probation found to have broken their terms of release and for crimes committed on public transit or in the city’s parks and recreation centers. The idea of more cops on the street, however, angered the dozens of protesters in the crowd who say the solution isn’t more policing but instead addressing underlying issues like a lack of jobs, services and community mistrust of police. Many of them warned about the return of stop-and-frisk tactics and random police searches, which Bowser and others said are not part of the proposals. “At the end of the day, tougher police penalties and more cops, which have only been proven to have a negative affect, are something [Bowser’s] going to continue to support,” Eugene Puryear, a former D.C. Council candidate and Black Lives Matter activist, said after the speech. The mayor’s proposal will head to the D.C. Council when lawmakers return from summer recess in mid-September, with public safety issues poised to dominate the fall legislative agenda. There have been 103 homicides in the District so far this year, according to the Metropolitan Police Department, only two fewer than in all of 2014. D.C. Council Chairman Phil Mendelson, a Democrat, said in an interview he believes the crime package will be broken up into “a couple” separate bills. The proposals may mean months of hearings and debate, if the activism on show during Bowser’s speech is any indication. “To the extent they’re controversial pieces, they will not go through without a lot of public discussion and that means a somewhat slower process,” Mendelson said, adding that even less controversial bills can take a few months to pass. Mendelson, who in 2013 suggested measures similar to what Bowser is proposing, rejected the notion that the idea would enable stop-and-frisk policing. Independent At-large Councilmember David Grosso sided with the sentiments expressed by many of the activists in a series of tweets Thursday afternoon. “Increased penalties do not result in decreased crime. They're a blunt tool that grows the prison system,” he wrote. Congress Heights, where the address was held, is among the hardest-hit communities in the summer’s crime wave and one of the poorest in the District. The speech was held inside the structure that used to house Malcolm X Elementary School. The building has been shuttered for five years, Bowser said, leaving gaps in services such as recreation activities and safe spaces that residents in other parts of town enjoy. Steps from the school, stuffed teddy bears and empty liquor bottles memorialized Shaun Simmons, who was killed August 1 on that 1300 block of Savannah Street SE.